Ah....$50 for the base 30 sticker (they are still stickers, right?) set on eBay must be what I'm remembering. That's the only stuff I'm interested in, don't care about chase cards or autographs or sketches really, so I guess I will wait for the secondary market. A damned shame that Topps doesn't offer that 30 sticker set, although I suppose it would cut into and cannibalize their $150 chase-card-package option if they did. It's hard to fathom how we went from $50 boxes stuffed with so many many beautiful die-cut stickers (and fun bonuses), to $150 for a single set of 30 not-die-cut stickers in the span of a few years. Unless Topps lost tens of thousands of dollars on the first handful of Old School series? But weren't they breaking even? Other than that, this just seems to be project managers chasing bad ideas while changing the product to meet artificial demand (sketches and the ridiculous sketch card boom) and turning something that seemed to be working into something that is near-failing. Bad design and execution chasing bad ideas. It's a shame. 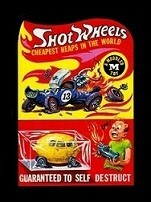 I LOVE Dave's work on Old School, but I loved the Wacky Packages Old School product completely when it was Old School. If it weren't for Dave's continued exceptional work on the series, I'd see little point going forward. What they've designed around that work is so far from the core appeal (to me) and so built upon the chase of the chase (the very opposite of the foundational Old School concept) that it is no wonder it's become lean. But, maybe that's all the collectible card hobby has going for it, at this point. At least the stickers (or sticker-like-cards) are still stunning. I'll keep around for those. You are remembering that base sets of OS 6 cost about $50 on Ebay. I know because I purchased two $150 sets last time to get all the roughs and sold my extra base set on the bay. Now that the roughs include a subset with puzzle backs ; a lot of people will be looking for a 30 card base set as well as the rough subset with puzzle and checklist. I can't understand why they did not mention the puzzle backs and checklist on the roughs in the web listing. That needs to be corrected so people understand what they are getting. I agree, base sets were going for about that much on ebay. I sold a few sets here for less, and will be able to help forum friends again. I also think that Topps was foolish to not include a note about the addition of puzzle and checklist backs on the roughs in the item descriptions - that might have prompted people to buy an extra $150 set to get all the roughs. Who wants a partial puzzle?? Another option for people who just want a base set is to buy the $150 set and sell off the extras. Is there a count of how many sets are being offered? Also would be nice to have a counter to display how many sets are left on the website. I think we had that last year and it was fun to watch it sell out. There were 400 sets for Old School 6. I was curious and looked this morning to see how many Old School 7 sets might be left, but they set a limit of 20 sets, so I couldn't tell. I'm interested in buying a base set, if you have any extras please let me know. Or if anyone else is looking to sell a set, please PM me. I can't wait to see what turns out on this one! According to my 5-27-18 post (reply #89) on the third page of the section on Attacky Packages, 47 Mars Attacks Attacky Packages have been made so far. That's four sets of 10 and seven extras. If three more are made, that'll be 50-five sets of 10. That's a great number for a whole series, I think...although Topps will probably want to make it 55. And, of course, that's not counting the eight Dinosaurs Attack! Attacky Packages and the four Mars Attacks/Judge Dredd Attacky Packages listed on the same post. I appreciate the generosity, but I'm at a loss how someone can buy a $150 set and sell the base set for only $50. Are the bonus Ludlows, roughs and sketch cards valued at 2/3 the cost? I think I bought a base set on eBay last year for $50, but like others here, I thought the price went up this year, so I bought the deluxe set. Maybe I should have waited, but I guess I can recoup some of the money I spent by selling the extra stuff on eBay. Oh, I like this! I used to wear those Superman Underoos when I was 4 or 5 years old. Heh. They did a re-release of them in adult sizes a couple years ago. Why did this set have to come out Black Friday weekend? I'm so broke. It doesn't help that I bought a bunch of Wacky sketches on Ebay this week either. Selling the base set for $50 is market price. Some buyers spend $150 in the hopes of pulling a few sweet sketches that can sell for $100 - $150 on their own. The back variants have a decent resale value; but sketches are where the resale value can be great. Pull mediocre sketches and you will lose on your investment. It's a gamble when it comes to reselling. Dealers that buy multiple $150 sets are playing the odds that they will pull enough good sketches to make a nice profit on their outlay. I'll be talking to Topps about the sketch problem. They need to A) give people two full months (at least) on sketches and B) eliminate some of the sketch people that consistently are not putting out quality sketches. Time for a culling. This set looks amazing (of course!) and I'm really hoping that it doesn't sell out before I get paid. LOL. Had to shell out $$$$ earlier this month for health insurance deductibles for my son, so I am super-broke right now. I can't afford it because... well, I'm 15! Failtastic Clod Rods: I think i just found my favorite OS 7 Card So cool! Dave, I think this is your best work yet!! Makes me wish there was a Wacky Packages Posters - Old School Edition! and all the detail on "Glue," Dave, that one is incredible! Pardon my ignorance (and shame on you, Topps, for not spelling this out better on your website), but if the puzzle pieces are on the back of the roughs, the numbers don't quite line up, right? I mean, there are 9 pieces to a puzzle but 30 roughs in a set. Does that just mean, from a complete set of roughs, that one could make 3 and 1/3 puzzles? If I do buy a $150 set, will I even be guaranteed a full 9 piece puzzle? If I do buy a $150 set, will I even be guaranteed a full 9 piece puzzle? I was wondering the same. I guess time will tell. Maybe there are no puzzles.. So if you buy the deluxe set, you'll get all that. I'm hoping for what you guessed, but if you buy just one deluxe set at $150 you only get 15 roughs. Hopefully that will include a full puzzle, at least one checklist, and 5 extras. I see trading ahead!! Thanks! I love doing Old School stuff. I barely slept the entire time working on them because I wanted them as detailed up as possible. That is a good suggestion! I will ask about posters. I honestly have no idea about the puzzles/ checklist other than I was told they would be sharing space with the rough cards and they asked me what the puzzle should be and I told them it had to be Unwanted Stickers since that is the Topps products. Failtastic Clod Rods if there was an additional puzzle but I suspect it will be one. Ah, that's right, it's only a half set in the deluxe. Cross fingers for good collation! Last time they came close, but we had a lot of "A" and "B" rough groups that varied by a card or two - I still have 6 stray cards left, and two are the same number (P2). And, it was easy to tell because the roughs had numbers on the backs (I kept getting P2, forget which I was shorted on). If we want numbers to make trading easier this time, we'll have to "number" these ourselves based on the checklist. That makes posting needs and extras lists a lot easier than typing titles in random orders......... Otherwise, maybe we can go in alphabetical order. Last time they came close, but we had a lot of "A" and "B" rough groups that varied by a card or two - I still have 6 stray cards left, and two are the same number (P2). And, it was easy to tell because the roughs had numbers on the backs. You're right. Lots of trading going on last time, which wasn't a bad thing, IMO. I rather liked getting to know some new folks that way. It's too bad that when you buy the $150 option you are not ensured a full puzzle and checklist with your base set. I think since you are getting half of the 30 pencil roughs; they could not have a and b sets with full puzzle/ checklist since few people would buy the other set if they were listed that way. They would sell out of the sets that included puzzles and get stuck with the sets that did not. Sales stop before we even get our sets, so thankfully we have here for trading. Hopefully they will break up the roughs as discussed earlier so a $150 set will include a full puzzle and a checklist. If not, perhaps trading here will help without costing people Ebay fees. Ooh, puzzles and checklists are now on the backs of cards again! Yipee! It's like All New Old School Series! Keep on cutting corners, Topps!